Panzerfaust were mysterious and cryptic. Their lead singer, shrouded in black, stood behind the drummer. He must have been standing on a platform, because his figure loomed inhumanly tall. The vocals were reminiscent of extreme metal in their intensity and power, layered with black metal influences in the instrumentation. 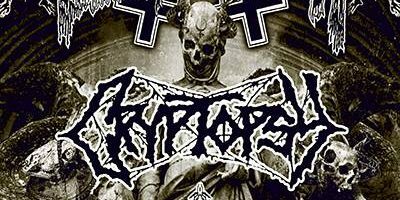 Black, death, and extreme metal subgenres are all exemplified with this terrific band. Cryptopsy played a variety of songs, spanning from their seminal work in the early 90s, to their newer releases as recent as 2015. I recognized a few of my own favorites from the popular album None So Vile, such as Slit Your Guts. This technical track evokes the jazzy prog of other bands such as Athiest or Skinless. However, this track is unique in its own right, marching to its own syncopated beat. Lead vocalist Matt McGachy and bassist Olivier Pinard both had badass headbanging skills on top of their excellent musical talent. Their waist-length hair was spinning in windmills. Drummer Flo Mounier and guitarist Christian Donaldson were similarly brutal and crushing in their technicality. One of the great aspects about Launchpad as a venue is that they go out of their way to have shows for 18+, keeping the stage area separate from the bar. On that note, it’s also pretty rad that they have a cool balcony area for patrons over 21. The moshing and headbanging audience were clearly visible from here, and of course the bands were always front and center. From that vantage point, a photographer can get some interesting angles. Cryptopsy in particular seemed to strike some uncharacteristically sassy poses. Maybe it was the view from the balcony, or maybe it was something to do with them being French Canadian. Either way, I certainly enjoyed the view. 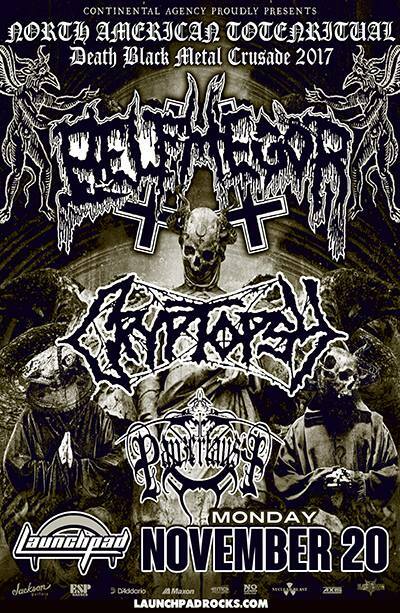 Belphegor were gutwrenching and gruesome. These black metallers from the European steeps were built tall and broad. Their figures were even more imposing with ashen corpse paint and jet black apparel. Lead vocalist and guitarist Helmuth, bassist Serpenth, and drummer Bloodhammer all originate from different parts of Europe. As such, their music embodies several multifaceted aspects of metal, from melodic black metal to brutal death metal. Albuquerque’s metal scene is thriving. This was yet another insanely heavy line up playing for an enthusiastic New Mexican crowd. Cryptopsy thanked the audience and mentioned how great it was to come to the area again. All of the bands killed it, and their loyal fans in Albuquerque will faithfully await their triumphant return. Four stars out of five!